Today and tomorrow only, Lettering Delights has an amazing deal on a huge SVG bundle. 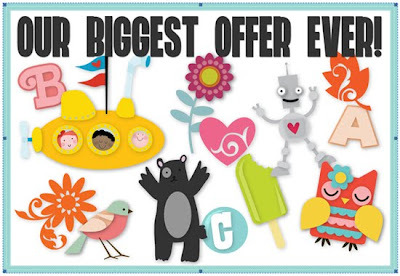 The bundle includes 3 basic alphabets, 7 deluxe alphabets and over 1400 cuttable images (including cards, envelopes, boxes and more) in a huge variety of themes! The price for the bundle is $100, which is a savings of 78%, or just 7 cents per image. For even more savings, check a recent receipt from Lettering Delights for a 25% off coupon, and get this bundle for $75. You can click on the image below to grab the bundle from Lettering Delights, but hurry, the sale is today and tomorrow only!